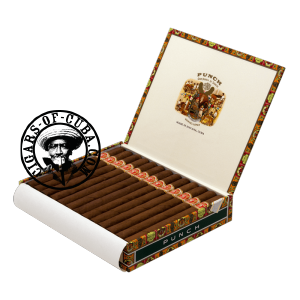 Most smokers will agree that the Double Corona is the leading cigar in the Punch brand. Offering more body than the Churchill, the earthy/leathery/woody flavors develop in perfect balance throughout the multiple phases of this complex cigar. In the first phase, sweet notes of honey intersperse base flavors giving a very distinctive, never aggressive, tone. These flavors become more pronounced in the second phase and keep building in a powerful ascension toward a strong finish. This is a cigar for regular smokers and one that will become so much better with time in the humidor. The Punch Double corona is ideal after a good lunch. It remains one of the top Double Coronas. A full bodied cigar delivering a spicy but smooth smoke. It's a perfect for the aficionados of big shapes.